Kungkungan Bay Resort is an impressive and spacious resort occupying an enviable position overlooking the quiet and unique Lembeh Strait. KBR, as the resort is known locally, is a favourite with divers from around the world and is revisited by many of them year after year, retaining its unique local atmosphere and character. The public areas are set out in an attractive open plan layout, with panoramic views over the water and a visit to KBR's Spa is not to be missed. Clients on the all inclusive dive package can enjoy unlimited access to the resort's house reef during daylight hours from its on site dive centre and jetty. Regaldive are able to offer Garden and Beachfront Cabins, which are very cost effective. Prices indicated are based on this room type, which is smaller than the other rooms, but comfortable. The Cabin rooms have a maximum occupancy of two and feature en-suite bathroom and air-conditioning. They share a large verandah facing the Lembeh Strait. The special menu is focused on Indonesian and Asian fare offering a culinary tour of the region. Food can be ordered from the full menu for extra charge. Transfers can be arranged for an extra charge. Additional diving and upgrades can be purchased locally. In addition, the resort has 17 spacious and attractive en-suite rooms, within 4 categories. All have partial or direct sea view, with ceiling fan and air-conditioning as well as a mini bar, tea/coffee facilities, and hairdryer. 8 Beachfront Cottage Suites have a queen or queen twin beds, sitting room area, verandah, large shower room (one or two also have a bath tub) and TV. A couple of the cottage suites can take extra beds for 3 & 4 person occupancy. 3 Traditional Houses have mainly two queen sized beds (one has a queen and two singles) and shower room and TV. 4 Beachfront Villas and 1 Hillside Villa offer a king-size bed, open plan living area, spacious verandah and large bath/shower room. The Owner's Suite is built on stilts and centrally located. Fully furnished the master room features a king bed and the second bedroom, twin beds. En-suite bathroom and lounge with TV. The resort operates a no smoking policy in all room types. There is an attractive restaurant with lovely views offering local and international choices (full menu), built over the water. The upper floor offers a bar, and there is an attractive pool with swim up bar. The resort also offers traditional Indonesian massage and treatments in their lovely spa. Free WiFi internet access is available. The dominating volcanic landscape creates a dramatic backdrop to the world class diving available in North Sulawesi. Conditions are generally calm all year round, and the deep waters afford excellent visibility averaging 25m. The seas are home to many unusual species, ranging from the prehistoric ‘coelacanth’ fish through to reef shark, green turtles, napoleon wrasse and dugongs. The majority of sites are easily accessible and they are rarely crowded. Manado is extremely popular with photographers, who relish the fascinating marine life, excellent conditions and facilities. Diving in the region is concentrated over two areas: Bunaken National Marine Park and the Lembeh Strait. The Bunaken National Marine Park has won numerous international conservation awards and is home to the majority of the dive sites that are accessible from Tasik Ria, Mercure Manado Tateli and Siladen Resort & Spa. Most of the reefs of the Bunaken National Marine Park are rich and unspoilt, offering pristine and abundant soft coral and fish life in huge concentrations. The night diving in the park is spectacular, providing frequent encounters with rare nocturnal creatures. For a change of scenery, the Molas wreck is remarkably intact for a WWII ship, the bow resting at 25m and the propeller at 40m. The Bunaken National Marine Park consists of five islands: Bunaken, Manado Tua, Nain, Montehage, and Siladen, as well as a part of the North Sulawesi mainland. Diving in and around Bunaken is predominantly wall diving and drift diving. There are also numerous beautiful coral slopes that are suitable for novice divers. There are 22 official dive sites within the park. The variety of both fish and soft coral is outstanding, and marks out this area as one of the most bio diverse marine environments in the world. With visibility around 25m and water temperature 26-30°C, this is an excellent destination for underwater photographers and naturalists alike. Schools of barracuda and jacks, green turtles and reef sharks, sea snakes and Napoleon wrasse are among the resident inhabitants of these steep coral walls fringing Bunaken Island. The Lembeh Strait is world famous for its macro life. This is arguably one of the finest destinations in the world for macro and photography enthusiasts. Lembeh plays host to a cornucopia of weird and wonderful creatures that are found here and here alone. Diving is over shallow black sandy slopes where seahorses and nudibranches are found in abundance. Many of the species that are encountered are simply not found elsewhere. Inimicus devilfish, dwarf lionfish, scorpion fish, puffer fish, mimic octopus, pegasus sea moths, frogfish, ribbon eels and flying gurnards to name but a few. The Lembeh Strait is a unique dive destination and a haven for experienced divers who are looking for species that are unusual and rarely seen. The dive guides and instructors are extremely experienced in locating and identifying the many unusual species that are encountered in the Lembeh Strait. Divers can easily combine stays between the resorts of Tasik Ria, Mercure Manado Tateli Beach Resort and Siladen Island on the Bunaken side, with Dive Into Lembeh, Eco Divers Resort Lembeh and Kungkungan Bay Resort on the Lembeh side. Many guests also opt to combine a liveabaord in Indonesia with a land based option in Manado. Please ask a member of the Regaldive team for more information. As there are a finite number of dive spaces available at these resorts, divers are highly recommended to prebook their diving, particularly if you require any courses or speciality dives. Please ask us about 'All-Inclusive' dive packs available with accommodation. These centres have a worldwide reputation for the quality of their photographic training and services. The dedicated facilities are staffed by qualified photography instructors and technicians, providing guests with some of the best underwater photographic support to be found anywhere. The centres provides slide film and digital processing, along with both rental and sale of cameras, lens and strobes. PADI photography speciality courses are available and photo seminars with guest lecturers are held regularly through the year. The local crew are experienced in handling cameras and carrying out maintenance and repairs. Slide scanning and saving to CD services are also provided. If you want to hone your buoyancy & photographic skills, especially macro photography, this is an excellent place to do it. The dive centre at Tasik Ria is managed by the highly experienced team, the '2 'Daniels', part of the original Eco Divers team. The dive centre is a PADI 5 Star IDC resort offering fully guided diving from their three purpose built day boats, in addition to two large speedboats and a local style wooden boat. Day trips are offered to Bunaken Marine Park giving divers a variety of wall, macro and muck diving opportunities. The centre also offer a range of courses taught in various languages by their highly qualified team of PADI and in-house trained NAUI instructors. The 3 purpose built 16m dive boats have a large dive platform plus full safety and navigation equipment. Each boat has a covered dining area, large sun deck, WC and can take 15 guests comfortably. The centre offers a diver / guide ratio of 4:1 whenever possible, giving great personal service across all dive experience levels and abilities. It can also organise special day trips to dive the Lembeh Strait's fabulous muck diving sites. For learner divers looking to take their first steps or gain more experience in a more far flung corner of the work, Tasik Ria offers this chance. Options available at Tasik Ria Divers include 4, 5, 6 and 7 days boat diving packages, all of which include up to 3 guided boat dives per day. Please discuss your requirements with the Regaldive team, who will prepare a quotation suited to your needs. Note: All local prices listed above are an indication only, and are subject to change. The expertly run PADI dive centre at “KBR” is based around 'muck' diving and the area's extraordinary variety of macro life, hiding in the black sandy slopes and stunning coral heads. A maximum group size of just 4 guests per guide is provided, to allow plenty of space for photographers and a gentle pace of diving. The dive centre have a fleet of fast speedboats allowing access to all 56 dive sites from the resort's own jetty, all within a 15 minutes radius. The resorts guides have finely tuned vision to spot a dive site's rare critters, finding camouflaged and elusive creatures where you swear there are none! The dedicated dive team will look after your equipment, rinse it down after a days diving and store it for you in a security watched area. At the end of the week the centre will wash and dry your equipment ready to take home. Options available at Kungkungan Bay Resort Divers include 4, 6, 8, 10 and 12 boat dives packages, plus 4 and 6 house reef options. Please discuss your requirements with the Regaldive team, who will prepare a quotation suited to your needs. Note: All local prices listed above are an indication only, and subject to change. Siladen Resort & Spa's PADI 5 Star resort operates exclusively to guests staying at Siladen Resort and Spa. Running a professional and small, friendly outfit, they place high emphasis on protection of the national marine park and its environment. The multi-lingual dive centre operates with a maximum of 4 divers to each guide and offers an intro dive to non-divers free of charge if staying 7 nights or more. 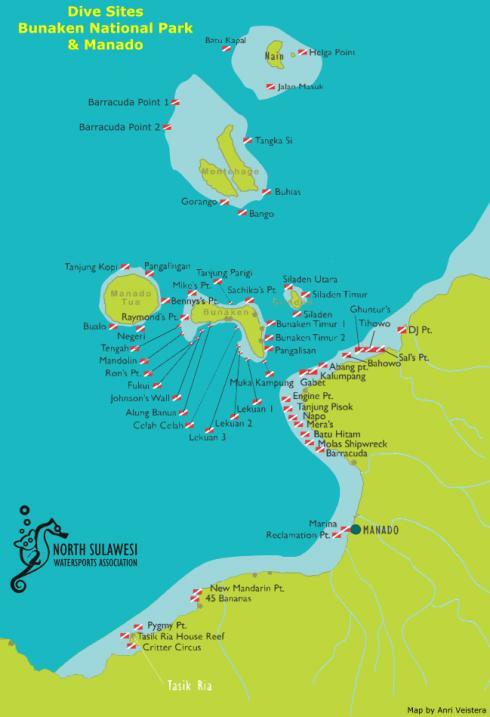 It has access to 50 excellent dive sites and special trips on request to Lembeh, Bangka & Popo. Night dives are offered every night. There are no shore dive sites available; the diving is operated from 4 traditional Indonesian style vessels with a maximum of 8 to 12 guests per boat. It is compulsory to dive with a dive computer in resort. Each diver must have their own computer. Diving with knives and gloves is not permitted in the Bunaken National Marine Park. We recommend you pre-book your dive packs with Regaldive prior to departure in order to secure your diving benefit from slightly lower rates than you will pay in resort. Options available include 6, 11, 15, 20 and 25 boat dives packages (Air or Nitrox). Please discuss your requirements with the Regaldive team, who will prepare a quotation suited to your needs. The resort carries 100 x 12 litre aluminium tanks with INT and DIN valves along with smaller tanks for children. DIN Adapters are also available. Based at the beautiful Mercure Manado Tateli Beach Resort, Eco Divers offers its renowned personal diving and snorkelling services. A maximum group size of just 4 guests per guide is attained whenever possible, to allow plenty of space for photographers and a gentle pace of diving and the dive centre is kitted out with a dedicated camera room and well-designed jetty. Eco Divers Manado have purpose built dive boats with modern facilities in traditional style, equipped with toilet, rinse tanks and sundecks. Small groups of 8 divers are taken out for 2 morning dives and a leisurely afternoon dive if you have booked that option. A variety of speciality and further dive education courses are also available in addition to those listed below. We recommend you pre-book your dive packs with Regaldive prior to departure in order to secure your diving benefit from slightly lower rates than you will pay in resort. Eco Divers Manado offers options for 2 morning boat dives or a full day dive trip (up to 3 guided boat dives). Please discuss your requirements with the Regaldive team, who will prepare a quotation suited to your needs. Full equipment (Regulator, BCD, Wetsuit, Mask and Fins): €9 for 1 dive, €27 for 24 hours. Well established in Manado, Sulawesi, Eco Divers Resort Lembeh offers a small, professionally run dive experience. Divers join the boat Nautica, 15 minutes drive from the Eco Divers Resort. Nautica is your floating base during the day, taking you from site to site. Nautica offers a shaded salon, two toilets, shower, tea and coffee facilities and a large sundeck. A hot buffet lunch is served on-board each day. Dives are conducted from 2 speedboats, with jump gate for ease of entry / exit and steel ladder. Each boat takes 8 divers and has tank racks and a seated dive deck. Wherever possible, a ratio of 4:1 divers: guide ratio is aimed for. Guests may charge their cameras or bring their laptop onto the boat as an onboard generator is available. Options available at Eco Divers Resort Lembeh included 3, 6, 10 and 15 days diving packages. Please discuss your requirements with the Regaldive team, who will prepare a quotation suited to your needs. Full equipment (Regulator, BCD, Wetsuit, Mask and Fins): €8 for 1 dive, €30 for 24 hours. The Lembeh Strait has long been established as one of the best macro diving spots on the planet. Although famous for its “muck diving “ on black volcanic slopes the area also boasts some wonderful coral dive sites, including the housereef at Lembeh Resprt. Dive into Lembeh schedule 3 day dives per day on twin engine fiberglass dive boats to a choice of more than 60 dive spots in the Lembeh Strait. After every dive the boats return back to the resort so you can enjoy your surface interval by the swimming pool or make any adjustments to your camera before your next dive. A night dive by boat is available daily, providing there is a a minimum of two people. If you have booked a diving package (starting from four nights with three days diving), then there is FREE access to the two world famous house reef dive sites (“Hairball” and “Aw Shucks”) from 07:30 AM – 18.00 PM. The fully equipped dive centre has a spacious camera room and dedicated camera rinse tanks. There is also a guest dive gear locker room, with gear rinse tanks and showers for after the dive. The dive guides are trained in camera handling and are specialised in working in Lembeh’s unique underwater environment. Manado is easily reached via Singapore with a connection flight time of around 3.5 hours, into Manado International airport. There are 4 connections per week to/from Singapore - Manado and daily flights to Singapore from the UK. Flights may also be available with Etihad, Emirates and Gulf Air, with separate ticket Jakarta - Manado with LionAir. Anyone booking the full package through Regaldive will receive local supplier assistance from the moment they exit customs at the airport, and all our packages include land and boat transfer where applicable, unless otherwise requested. Taxis are readily available, but it is recommended that you seek assistance from reception at your local place of stay for any additional travel and excursion arrangements you may wish to make in situ. You can enjoy fine diving year round in Manado. Located just above the equator, temperatures remain constant throughout the year with highs near 33°C and lows that rarely fall below 27°C. Humidity may be high during the rainy season. The water temperature ranges between 27°C and 29°C. The sunniest season is from April to November. It does rain through out the year, with rainfall rising between December and March. Showers tend to be brief and heavy. If you are looking to enjoy some rainforest walks or white water rafting, it is better to travel in the rainy season (but again it is year-round) because that is when the forest and highlands are watered and are at their most lush. We suggest a 3mm or 5mm full suit (or dive-skin for those who do not feel the cold) for divers and snorkellers, to protect against any stinging hydroids. It is normally shorts and t-shirts by day (even if it rains, because it is warm tropical rain) in resort. The night time dress code is light and casual. If you are venturing any further, we recommend more modest dress with loose fitting clothing. Manado is +7-8 hours ahead of GMT depending on summer/winter time in UK. The official language spoken is Indonesian. English is widely spoken. All items must be paid in local currency (Rupiah) due to laws and regulations in Indonesia. Visa and Mastercard are accepted in all the resorts but may incur a local bank charge and card transactions are billed in Rupiah. British Pounds are not accepted in Manado. The most useful currency to take is the US Dollar. Exchange rates are usually published every day at the reception and some are able to exchange a small amount in resort. You can withdraw cash in Rupiah from the ATMs at the local banks, provided you have your PIN number with you. Also, if you make it to town before 2pm, you can draw up to Rp 3,000,000 on a Visa card or Mastercard inside the banks (you must present your passport with your credit card). It is not possible to use travellers' cheques in local shops, dive centres and resorts. Travellers' cheques can only be cashed in the bank by the owner of the cheque, with a form of photo I.D. Although entirely voluntary, tipping is a recognised part of life in this region of the world. Some local staff look to guests for personal recognition of particular services offered. 220 volt electricity with standard European round pin electricity plugs. Manado is the regional capital of North Sulawesi and serves as an ideal base to explore this area of outstanding natural beauty. Trek to the Kali Waterfall and the 'Tangkoko' rainforest where the world's smallest primate, the Tarsier monkey, lives. You can climb a volcano or take to white-water rafting. Then there's the geography of the area including paddy fields, spice plantations and markets. Excursions are available from all the resorts. Should you wish to try the local cuisine in town one night, you can reach Manado town from Tasik Ria Resort in around 30 minutes by taxi. These can be easily ordered through the hotel reception and cost about US$6 each way. Manado's 'Warung' restaurants offer excellent seafood, Asian and (some) western food cuisine. Eating out is extremely cheap, with most meals costing only around US$5. After dining, there is a reasonable but limited nightlife - a few good bars with live bands playing most nights; you can also shop at night for clothes and snacks. Guests at both Siladen Resort & Spa and KBR are more limited in outside evening activities due to their location. Guests staying in Eco Divers Resort Lembeh are based in Bitung town. Flights with Singapore are with Singapore airlines, via Singapore into Manado International airport. There are currently 4 connections per week to and from Singapore to Manado. Flights from London Heathrow to Singapore are daily. Flights may also be available with Etihad, Emirates and Garuda Airlines with an onward flight to Manado with LionAir. Singapore - Manado 3 hours and 35 minutes. Passengers travelling to Manado should have minimum six months valid on their passport from the date of return to the UK, plus one full page free. Hotel receptions may be required to take a photocopy of your passport for registration purposes. There are no compulsory vaccinations for travel to Manado, although we recommend protection against typhoid, tetanus, hepatitis A and polio. Vaccination requirements are subject to change and should be confirmed before departure with your GP or local travel clinic. There are plenty of chemists and dentists in Manado and the general hospital has a good recompression chamber. Further information on vaccinations for travel to this country can be found at www.fitfortravel.nhs.uk and from your local healthcare provider. Attentive Service and 14 Trips With Regal So Far! "The transfers and ground arrangements were effective and efficient. The transfer via the airport was managed well – the Kungkungan Bay Resort driver ensured we were properly handed over to the Siladen staff member and not just dropped off in the general area, and we did not have to wait too long before leaving the airport. It is always good to go to and from Siladen as they use a large boat with a covered seating area and plenty of room for baggage. Accommodation was very good at both resorts. Food was also very good at both resorts, each in their own way. Kungkungan Bay Resort continues to offer its menu with a wide range of food options. A Siladen dinner is very much to the standard of eating in a good restaurant, whether buffet or from a menu. As Kungkungan Bay Resort has short trips to all dive sites they come back to the resort between the two morning dives and the staff bring down tea/coffee/chocolate and fresh-made cookies to have in a covered seating area on the jetty. This year they have added afternoon hot drinks brought to the dive centre area on return from the afternoon dive. Dive centre Staff and Crew were very good at both. They each continue to fully handle dive kit in all regards. Each day it is taken to the boat, set up, changed over between dives, and removed from the boat and rinsed at the end of the day. Crew is attentive to providing assistance if needed pre-and post-dive, and handle cameras with care when passing to and from divers. At Kungkungan Bay Resort with small boats and short trips you look after your own wet suit as it is put on and off on the shore. At Siladen, with longer trips on larger boats you just leave your wetsuit and boots on the boat at the end of the day and they reappear the next day. Dive guides are good at both resorts with enough guides to ensure small groups and pointing out a good deal of things. Kungkungan Bay Resort, as in previous years, is particularly good at this taking great care to find the remarkable things that live in Lembeh and every dive would find many creatures of note thanks to their knowledge, skills and experience. If you let the guide know there is something in particular you would like to see, they will do their very best to find it. They also take note of your interests, so as I often photograph nudibranchs, our guide would always take particular care to ensure that I was aware of any nudibranch he saw, be it an unusual species, a tiny one that was all but invisible, or one that was in a particularly photogenic position. Lembeh has a good range of dive sites with chances to see a considerable range of the quirkier Indo-Pacific sea life along with some of the more “ordinary” items, and for a bit of variety Kungkungan Bay Resort will occasionally do a more conventional reef dive to complement its usual sandy bottom dives. Bunnaken offers a good deal of classic reef walls many very healthy with a good range of things to see. They will occasionally do a mainland dive where there are sandy slopes to add variety in things to be found. Both offer good night dives. I seem to have managed to have 14 trips with Regal so far, so you must be doing something fairly well... I may well be back." At Tasik Ria we were accommodated in the same two lovely beachfront cottages as before. When we arrived at Kungkungan Bay Resort they had mistakenly booked us into a one-bedroom apartment, but when we insisted that we had to have separate bedrooms, they eventually put us into two separate “cottages” on stilts, just past the dive centre. These may have been a free upgrade! They were really luxurious. Food was superb at both places – we particularly enjoyed all the fresh fruit. At Kungkungan Bay Resort I asked if they had cereal e.g. cornflakes for breakfast – no? – “it doesn't matter”, but the next morning they produced cornflakes for me anyway! At Tasik Ria I can't thank Dan, the manager, enough for looking after us so well, especially when I had a minor ailment and later felt unwell the morning of the transfer to Kungkungan Bay Resort (it was just dehydration, but he phoned Kungkungan Bay Resort that evening to find out how I was). My buddy lost some sleep due to local people partying nearby, but that was beyond Dan's control, and Kungkungan Bay Resort was blissfully quiet. The attention from staff and dive crews at both places was superb. At Kungkungan Bay Resort we had two guides (one guide each) on every dive, with a dry towel provided after each one. Beforehand I had been apprehensive about my fitness, but all aches and pains disappeared, and I managed 26 dives altogether. My buddy did more (about 30), but I opted out of those where strong currents were possible. There are many good memories from the trip. One which stands out was my buddy filming a coconut octopus at Kungkungan Bay Resort when it tried to grab his camera! I can't begin to list all the marine life: turtles, frogfish, leaf fish, ghost pipefish, mandarin fish, and so on. I particularly liked a group of about a dozen colourful sea urchins moving along together, but each gyrating individually within the group. Also, it's always good to meet and chat with other divers. At Tasik Ria we met a lady who teaches and writes about underwater photography, a family from Sussex, and a party from Hong Kong led by a lady whose job consists of leading groups for a travel agency." KBR - Third Time, Still Amazing! "This trip was our third visit to KBR, as with the two times before it was amazing. From the welcome at the airport to the whole experience everything continues to exceed our expectations. The staff are always happy and smiley and can't do enough to make your stay even more wonderful. The accommodation is clean, tidy and very spacious. The food is al a carte and freshly cooked at every meal. The diving is basically a land based liveaboard, the dive guides are truly amazing and try their upmost to find the critters that you wish to see, and how they spot the little critters remains a mystery to us!!! Everybody that we have spoken to, that have been to KBR always say that it is the best place they have every been to. " "The good - the diving! It really is critter capital. It's also diamond service - no lugging kit back and forth, it's all done for you - now I'm a bit obsessive about my rig and wouldn't dream of getting in water without checking it myself but these guys are good - it was right every time. The dive guides are good - there's a wish list on the white board and these guys really do try and find what people want to see. Only very minor gripe - I booked dive packages via Regal based on two dives a day and three is very much the norm so I paid in resort prices for additional ten dives. Accommodation ? Fine, ageing slightly but still very much fit for purpose. Spa - Used by my non diving partner and apparently amazing and excellent value. Excursions - off gassing day - we went on "jungle" walk to see Tarsier - good value for money. Pool bar - mmm - didn't see it open all week. People - absolutely brilliant - seemed totally and genuinely happy to help and to see people have a good time. My bucket list of destinations is extensive but I might well take a return trip to KBR."